short & sweet ( and perpetually polished): baby it's coal outside & snowing! We're expecting a big snowstorm tomorrow, so tonight I felt like painting my nails in hopes of at least a couple inches! 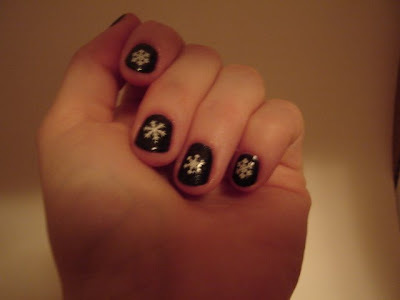 I chose baby it's coal outside as the color, then put snowflakes on each nail. Now I just gotta wait! Heres some pics without flash and with flash.